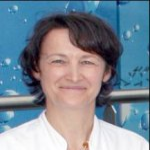 Christine Lasset, MD, PhD is Assistant Professor in Public Health at Lyon 1 University in Lyon and is the leader of the “Prevention and genetic epidemiology” Unit at Léon Bérard Comprehensive Cancer Center (CLB) in Lyon. This unit is part of CNRS UMR 5558 “Biometry and Evolutive Biology” at Lyon 1 University. C. Lasset is actively implicated in the cancer genetics clinic of the CLB where she provides genetic counselling. She is involved in the establishment of national guidelines for the management of individuals affected by such familial cancers. Her main research program is in the field of hereditary cancer. The first axis concerns the evaluation of cancer risk in germline mutation carriers using genetic epidemiology methods and is developed in collaboration with Valérie Bonadona, MD, PhD. The second axis concerns the early detection of cancer in high-risk populations, such as MRI breast cancer screening in female BRCA mutation carriers. Her team is also interested in cancer prevention in the general population and participates in different programs such as the evaluation of the impact of HPV vaccination in the population of the Rhône-Alpes region. Christine Lasset also heads the Public Health Department of the CLB which is involved in the medical evaluation of cancer treatments or screening and maintains the hospital-based clinical and biological database of the CLB for breast cancer, colorectal cancer and some hematologic malignancies. Christine Lasset is an author of 120 articles published in international journals with peer-review committees. "Maybe they have found something new" participants` views on returning cohort psychosocial survey results, Health expectations, vol. 18 pp.2425-2436. Practices and opinions regarding HPV vaccination among French general practitioners: evaluation through two cross-sectional studies in 2007 and 2010, International journal of public health, vol. 59 pp.519-28. Germline copy number variation of genes involved in chromatin remodelling in families suggestive of Li-Fraumeni syndrome with brain tumours, European journal of human genetics, vol. 21 pp.1369-76. HPV vaccination among French girls and women aged 14-23 years and the relationship with their mothers` uptake of Pap smear screening: a study in general practice, Vaccine, vol. 31 pp.5243-9. Prevention of sexually transmitted infections among girls and young women in relation to their HPV vaccination status, European Journal of Public Health, vol. 23 pp.1046-1053. Which factors predict proposal and uptake of psychological counselling after BRCA1/2 test result disclosure?, Psycho-oncology, vol. 23 pp.420-427. Factors associated with Pap smear screening among French women visiting a general practitioner in the Rhone-Alpes region, Revue d`épidemiologie et de santé publique, vol. 61 pp.437-45. Lack of referral for genetic counseling and testing in BRCA1/2 and Lynch syndromes: a nationwide study based on 240 134 consultations and 134 652 genetic tests, Breast cancer research and treatment, vol. 141 pp.135-144. BRCA2 deep intronic mutation causing activation of a cryptic exon: opening toward a new preventive therapeutic strategy, Clinical Cancer Research, vol. 18 pp.4903-9. Mutational characterization of individual breast tumors: TP53 and PI3K pathway genes are frequently and distinctively mutated in different subtypes, Breast Cancer Research and Treatment, vol. 132 pp.29-39. , European Journal of Human Genetics, vol. 20 pp.981-983. French women’s knowledge of and attitudes towards cervical cancer prevention and the acceptability of HPV vaccination among those with 14 – 18 year old daughters: a quantitative-qualitative study, BMC Public Health, vol. 12 pp.1034-1034. BRCA1/2 carriers: their childbearing plans and theoretical intentions about having preimplantation genetic diagnosis and prenatal diagnosis, Genetics in Medicine, vol. 14 pp.527-534. French women’s breast self-examination practices with time after undergoing BRCA1/2 genetic testing, Familial Cancer, vol. 11 pp.269-278. Exposure to diagnostic radiation and risk of breast cancer among carriers of BRCA1/2 mutations: retrospective cohort study (GENE-RAD-RISK), BMJ, vol. 345 pp.e5660-e5660. Uptake of a randomized breast cancer prevention trial comparing letrozole to placebo in BRCA1/2 mutations carriers: the LIBER trial, Familial Cancer, vol. 11 pp.77-84. Common alleles at 6q25.1 and 1p11.2 are associated with breast cancer risk for BRCA1 and BRCA2 mutation carriers, Human Molecular Genetics, vol. 20 pp.3304-3321. Variants in the Netrin-1 Receptor UNC5C Prevent Apoptosis and Increase Risk of Familial Colorectal Cancer, Gastroenterology, vol. 141 pp.2039-2046. Common variants of the BRCA1 wild-type allele modify the risk of breast cancer in BRCA1 mutation carriers, Human molecular genetics, vol. 20 pp.4732-47. Breast and ovarian cancer screening of non-carriers from BRCA1/2 mutation-positive families: 2-year follow-up of cohorts from France and Quebec, European Journal of Human Genetics, vol. 19 pp.494-499. Variation in breast cancer risk with mutation position smoking alcohol and chest X-ray history in the French National BRCA1/2 carrier cohort (GENEPSO), Breast Cancer Research and Treatment, vol. 130 pp.927-938. Perception et pratique de la vaccination HPV par les gynécologues : une étude quantitative et qualitative en Rhône-Alpes, Gynécologie Obstétrique & Fertilité, vol. pp.1-7. Human papillomavirus (HPV) vaccination: Perception and practice among French general practitioners in the year since licensing, Vaccine, vol. 29 pp.5322-5328. Common Genetic Variation at BARD1 Is Not Associated with Breast Cancer Risk in BRCA1 or BRCA2 Mutation Carriers, Cancer Epidemiology Biomarkers & Prevention, vol. 20 pp.1032-1038. A locus on 19p13 modifies risk of breast cancer in BRCA1 mutation carriers and is associated with hormone receptor-negative breast cancer in the general population, Nature Genetics, vol. 42(10) pp.885-895. , Genetics in medicine, vol. 12 pp.801-7. Contribution of cell culture RNA extraction and reverse transcription to the measurement error in quantitative reverse transcription polymerase chain reaction-based gene expression quantification, Analytical Biochemistry, vol. 393(1) pp.29-35. Prognostic value of Dicer expression in human breast cancers and association with the mesenchymal phenotype, British Journal of Cancer, vol. 101(4) pp.673-683. Etudes de cohorte et études pronostiques, La revue du praticien, vol. 59 pp.535-538. Age-Dependent Cancer Risk Is Not Different in between MSH2 and MLH1 Mutation Carriers, Journal of cancer epidemiology, vol. 2009 pp.791754-791754. Novel biallelic mutations in MSH6 and PMS2 genes: gene conversion as a likely cause of PMS2 gene inactivation, Human Mutation, vol. 28 pp.1084-1090. , Journal of Clinical Oncology, vol. 25(25) pp.3831-3836. Sporadic and epidemic community legionellosis: two faces of the same illness, European Respiratory Journal, vol. 30 pp.813-813. Mésothéliomes familiaux : une composante génétique associée aux risques environnementaux ?, Bulletin du Cancer, vol. 94 pp.705-710. Identification and management of HNPCC syndrome (hereditary non polyposis colon cancer) hereditary predisposition to colorectal and endometrial adenocarcinomas, Pathologie Biologie, vol. 54 pp.215-229. Breast cancer risk in BRCA1 and BRCA2 mutation carriers and polyglutamine repeat length in the AIB1 gene, International Journal of Cancer, vol. 117 pp.230-233. Common BRCA2 Variants and Modification of Breast and Ovarian Cancer Risk in BRCA1 Mutation Carriers, Cancer Epidemiology Biomarkers & Prevention, vol. 14 pp.265-267. Prognostic factors of response or failure of treatment in patients with metastatic renal carcinomas treated by cytokines: a report from the Groupe Français d’Immunothérapie, World journal of Urology, vol. 23 pp.161-165. HNPCC syndrome (Hereditary Non Polyposis Colon Cancer): identification and management, Revue de Medecine Interne, vol. 26 pp.106-118. Interleukin-6 Interleukin-10 and Vascular Endothelial Growth Factor in Metastatic Renal Cell Carcinoma: Prognostic Value of Interleukin-6—From the Groupe Français d’Immunothérapie, Journal of clinical oncology, vol. 22(12) pp.2371-2378. Identification and management of HNPCC syndrome (hereditary non polyposis colon cancer) hereditary predisposition to colorectal and endometrial adenocarcinomas, Bulletin du Cancer, vol. 91 pp.303-315. BRCA1 wild-type allele modifies risk of ovarian cancer in carriers of BRCA1 germ-line mutations, Cancer Epidemiology Biomarkers & Prevention, vol. 2 pp.90-95. Cancer Patients Who Experienced Diagnostic Genetic Testing for Cancer Susceptibility: Reactions and Behavior after the Disclosure of a Positive Test Result, Cancer Epidemiology Biomarkers & Prevention, vol. 11 pp.97-104. Sporadic multiple primary melanoma cases: CDKN2A germline mutations with a founder effect, Genes Chromosomes & Cancer, vol. 32 pp.195-202. Neurofibromatosis and early onset of cancers in hMLH1-deficient children, Cancer Research, vol. 59 pp.294-297.